We warmly welcome new players to the Yarra Valley Hockey Club. Our community-minded club aims to support the development of players at all levels, through the individual attention of our dedicated coaches and the support of our extensive coaching networks. 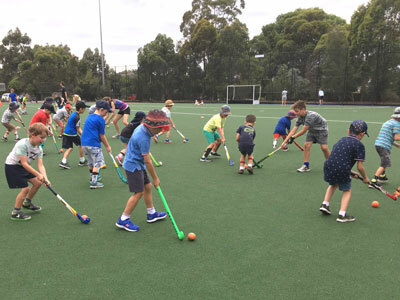 For beginners, Yarra Valley offers the HookIn2Hockey program, as well as delivering programs at local primary schools. Supported by Hockey Victoria, these programs are specifically targetted towards young players with no prior hockey experience. They are the ideal entry point for kids who would like to give hockey a try, as well as a great pathway for young players to develop into weekend competition hockey. Yarra fields teams in age Groups U8, U10, U12, U14, U16 and U18, and at times also has various teams play in Summer (October-February) and Indoor Competitions. Enquiries from new players should be directed to the appropriate Age Group Coordinator, or the Junior Coordinator. The club has a strong network of volunteers who support the club in its sporting, social and logistic endeavours. New club members and parents are strongly encouraged to become involved by volunteering in some capacity. There are many jobs to be done - click here to read more about our volunteer opportunities.